Mariko Fukao has played the euphonium with the Band since 2016. Mariko comes from Shimane prefecture in Japan, where she began playing the piano at age 4, and took up the euphonium at age 9 with her elementary school brass band. In high school, Mariko moved to the percussion section to explore something new, and found she was much at playing the euphonium. She played at a number of regional contests for brass bands, concert bands and small ensembles in Shimane, Osaka and Tokyo. Mariko moved to Thailand in 2007 for work. There she was fortunate enough to have the opportunity to play with many passionate young music students in the Silpakorn University Wind Orchestra. Mariko also was a member of the Lusaka Music Society when she lived in Lusaka, Zambia during 2015-16. There she had the interesting experience of covering cello and (occasionally) bassoon parts, which was quite a challenge for a brass player! 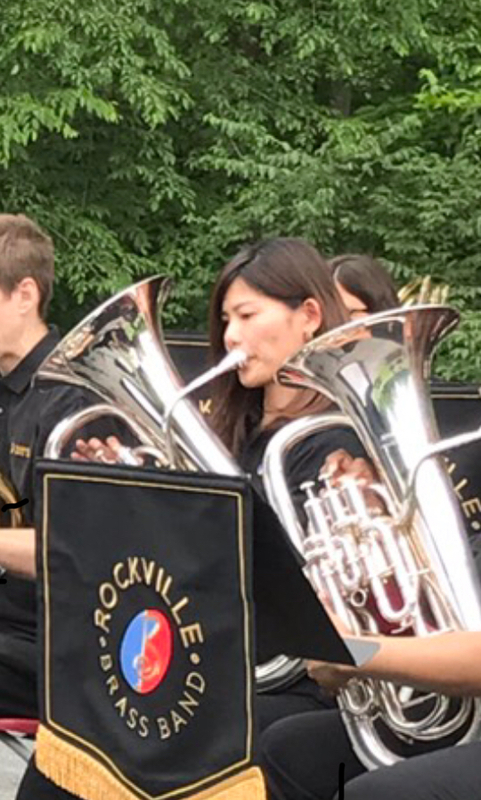 After moving to the U.S., Mariko was very excited to find the Rockville Brass Band, the first British-style brass band she has played with. Mariko has enjoyed being a part of the Band very much. Besides playing music, she likes cooking and traveling.